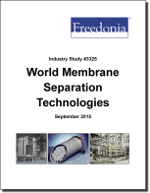 World demand for membranes will rise 8.5 percent annually to $26.3 billion in 2019. Industrializing countries such as India, China, Russia, Poland, and Brazil will show strong growth, while developed areas will remain intensive membrane users. Reverse osmosis, ultrafiltration, and nanofiltration will see above average growth. This study analyzes the $17.5 billion global membrane industry. It presents historical demand data (2004, 2009 and 2014) and forecasts (2019 and 2024) by product (e.g., microfiltration, reverse osmosis, ultrafiltration) and market (e.g., water treatment, wastewater treatment, food and beverage processing, pharmaceutical and medical) for six world regions and 21 major countries. The study also considers market environment factors, details industry structure, evaluates company market share, and profiles 41 industry players, including Danaher, EMD Millipore, and General Electric.